PRODUCT DESCRIPTION: Liquid insect repellent in a "ready to spray" formulation that's comprised of natural ingredients including garlic, white pepper and potassium. Conveniently packaged in a hose end sprayer, all you need to do is hook it up to your garden hose and spray away. 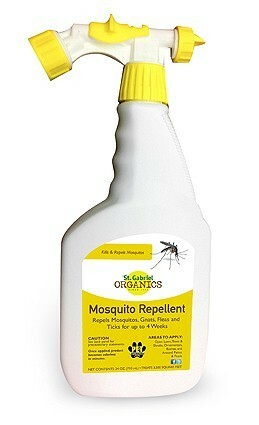 It's important to understand this product is merely an insect repellent and won't kill or hurt anything. It's safe to use around the home where pets and children are active and will not pose a hazard or danger to them. Once applied and allowed to dry undisturbed for at least 4 hours, treatments will last 4 weeks. When applying the spray, you will notice a slight odor but this will dissipate and be gone during the drying process. Once dry, it will be completely odorless. TARGET PEST: Fleas, Gnats, Mosquitos, No Seeums, Thrips and Ticks. RATE OF APPLICATION: Each quart will cover up 3,500 sq/ft of turf. Remember to spray up on plants and vegetation as nuisance pests like to hang and hide in plant leaves. Retreat at least once a month during active pest months in your region.